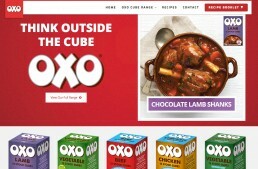 OXO Stock Cubes a popular consumer product in NZ wanted an online presence to promote and assist with their marketing efforts. We wanted the website to be vibrant, full of colour with each product page colour code to match each OXO products packaging. We also wanted to make sure the recipes were mouth watering and really jump off the page with full image headers with associated branding colours of each product.